The 18-year-old, pictured, is relishing his biggest moment in the game to date after taking the scalps of Nairn’s Sandy Scott and Alasdair McDougall (Elderslie) to reach Saturday's 36-hole title showdown. Locke has played for the Scotland boys’ side at national and European level and is also part of the Paul Lawrie Foundation, with the Ryder Cup stalwart tweeting his support of Locke over the famous Ayrshire links this week. “I go on the phone to him now and again. When I started in the Foundation Paul gave me his number and said ‘Look, anything at all, give me a call, no matter how silly you may think it is’. 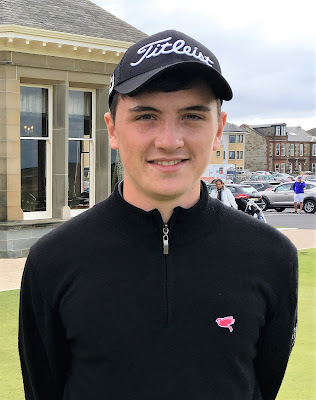 McDougall had earlier secured the third hole-in-one of the event at the 11th in his morning quarter-final win over Kilmacolm’s Matthew Clark, but Locke was too strong as he achieved back-to-back 3 and 2 successes. It is a member of this year’s Scotland Men’s European Amateur team that Locke now faces in the final, namely Ryan Lumsden. The London-born player, who is attached to Royal Wimbledon, plays for Scotland through his Edinburgh-born grandparents and his affinity for Caledonia. The 20-year-old, who works with Scots coach David Inglis at Northwestern University, near Chicago in the US, still enjoys golf trips to North Berwick to visit family. “I always played the Scottish boys’ championship rather than the English version, for example, because of my historical attachment. I’ve always wanted to play for Scotland really, because of the heritage and history, you can’t beat it. I’ve always had that emotion. Lumsden finished with an eagle at the 16th to defeat the ever-consistent Chris Maclean from Balmore 3 and 2, having beaten Irvine’s Stuart Easton by the same margin in the quarter-finals. MacLean had earlier come through against Williamwood’s George Burns by one hole, after Burns three-putted the last. The 36-hole final at the Open championship's birthplace starts at 8.30am tomorrow with entry free for all spectators. S Locke (Banchory) bt S Scott (Nairn) 3 and 2. A McDougall (Elderslie) bt M Clark (Kilmacolm) 1 hole. R Lumsden (Royal Wimbledon) bt S Easton (Irvine) 3 and 2. C Maclean (Balmore) bt G Burns (Williamwood) 1 hole. Locke bt McDougall 3 and 2. Lumsden bt Maclean 3 and 2.